These are not government websites. They are websites designed and operated by three political parties that are fighting tooth and nail to become the next government of Nova Scotia. One of them will form the next government and thus will, in a few weeks, be in charge of the design and operation of all Nova Scotia government websites. Their campaign sites can be viewed as a part of their resume as they compete for voter approval. 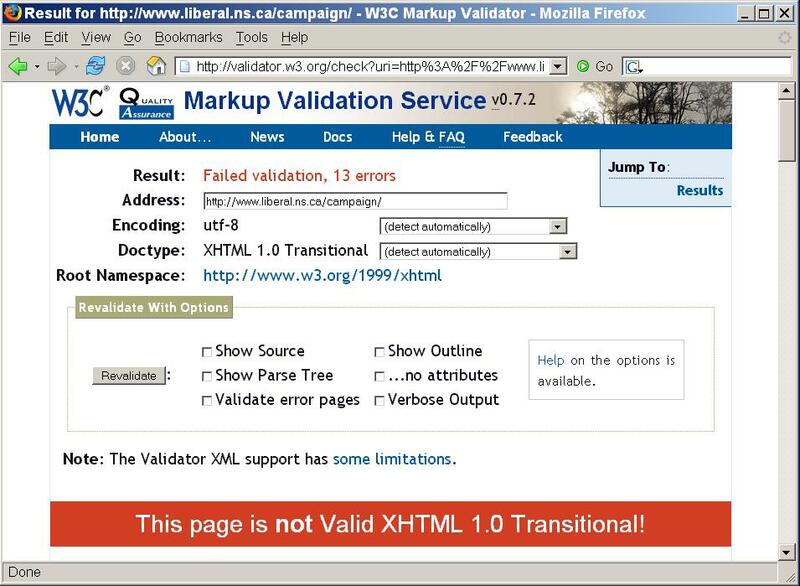 Failed validation report: Nova Scotia Liberal Party 2006 election website home page. For a full-size view, click on the image. 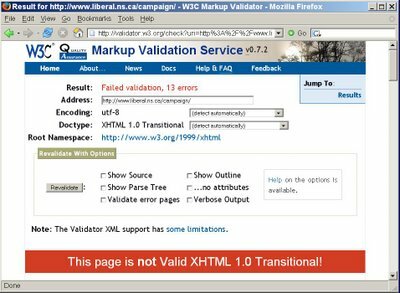 Failed validation report: Nova Scotia Progressive Conservative Party 2006 election website home page. For a full-size view, click on the image. 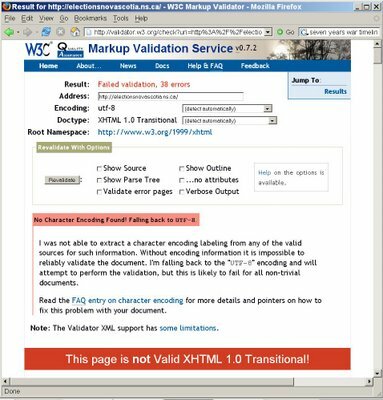 Failed validation report: Nova Scotia NDP 2006 election website home page. For a full-size view, click on the image. None of these three parties has seen fit to include a statement of their policies about website accessibility and/or interoperability. This omission provides, by itself, a revealing comment on the awareness, or lack thereof, of these party leaders with respect to the importance of such considerations in communicating with the public in 2006. If these standards are thought to be unimportant when they are fighting for public approval, is unlikely they will be given greater significance after the election is decided. "It is highly recommended that X/HTML coding be checked by running all documents through an X/HTML syntax checker. Style sheets should be checked with the free W3C online validator." This statement, including the links, is quoted directly from the Nova Scotia Government's Website Design and Content Standards. 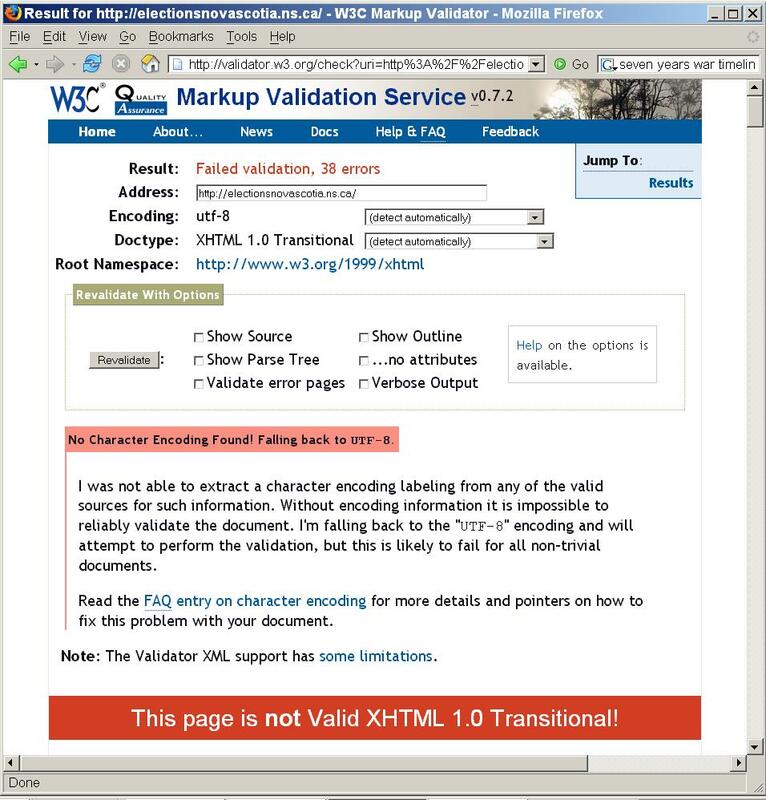 The validation recommended by this government standard is the W3C Validation Service, the same one I used to test these political party websites. BTW, the Nova Scotia Government's Website Design and Content Standards page validates successfully. This is a government website. 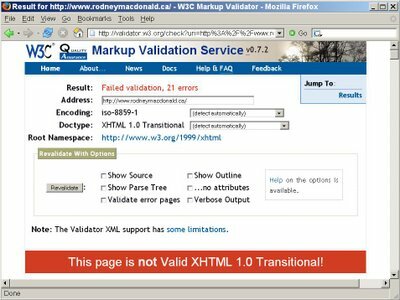 Elections Nova Scotia is completely ignoring the government website standards. Failed validation report: Elections Nova Scotia website home page. For a full-size view, click on the image. Map of Electoral District #2, AntigonishThis should take you to a map of the Antigonish electoral district. What you get is a huge 1.9 megabyte file that takes a full 7 minutes to download if you are on a dial-up connection (about 40% of connections are still dial-up at 56k). After the download was complete, I got not a map but an error message: "There was an error opening this document. This viewer cannot decrypt this document." This is a pdf file that requires proprietary Adobe Acrobat software to display the map. There's nothing wrong with my Adobe Acrobat software — it has worked fine with numerous pdf files I've looked at in the last few months. The main point is that this huge file with the long download time, and the pdf decryption hassle, is completely unnecessary. You can provide a satisfactory map like this as an ordinary jpg or gif file. A good full-screen map (say, 1000 pixels wide) would be about half a megabyte in jpg format, much less than the pdf file, and there would be no decryption problems. The only reason for providing this map in pdf format is the convenience of the webmaster; if the interest of the citizen viewer was taken into consideration pdf would not be the choice. interesting... but I would never choose my government based on their understanding of web design. Welcome to Elections Nova Scotia the one site you need for everything to do with voting in Nova Scotia during a provincial election.Whether you want to cast your vote, work during an election, be a candidate, or learn about the importance of voting, you’ll find it here.